Healthy economic growth, increasing emphasis on the development of the education sector along with a rising adult literacy rate are the major factors driving the growth of the stationery market in Bangladesh. Additionally, as the proportion of urban population continues to increase in the country, the development of new commercial spaces such as offices and educational institutes would drive Bangladesh stationery market forecast revenues in near future. According to 6Wresearch, Bangladesh stationery market size is projected to grow at a CAGR of 10.3% during 2018-24. The primary and secondary education enrolment rate of Bangladesh has been climbing steadily over the past years. Therefore, a significant portion of the demand for stationery items comes from the education sector in the country. Further, a growing e-commerce industry is also providing new avenues for the distribution of stationery products to the end consumers. In paper stationery, exercise notebooks held the largest Bangladesh stationery market share by types, while in the non-paper stationery segment, pen and pencil segments account for the biggest revenue and volume shares in the overall Bangladesh stationery market. Plans outlined under the national 7th Five-Year-Plan to achieve the education Millennium Development Goals over the next decade would help the stationery market to grow in the country. The Bangladesh stationery market report comprehensively covers the Bangladesh Stationery Market by types, applications and regions. The Bangladesh stationery market outlook report provides an unbiased and detailed analysis of the Bangladesh stationery market trends, opportunities/high growth areas and market drivers which would help the stakeholders to devise and align their market strategies according to the current and future market dynamics. •	Historical & Forecast data of the Global Stationery Market Revenues for the period 2014-2024F. 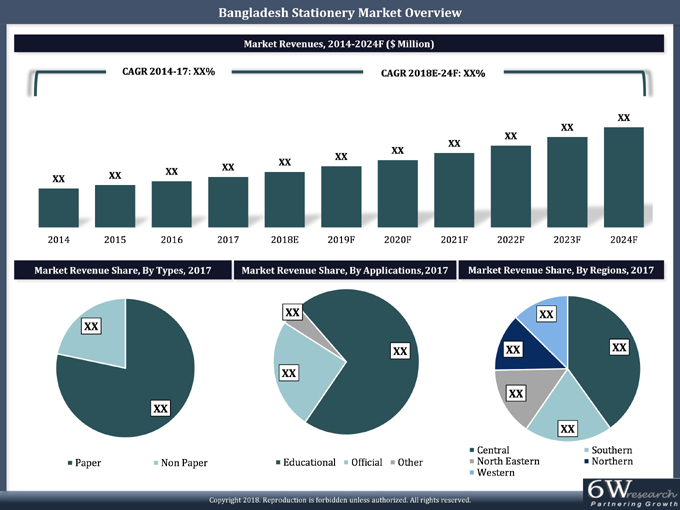 •	Historical & Forecast data of Bangladesh Stationery Market Revenues for the period 2014-2024F. •	Historical & Forecast data of the Bangladesh Paper Stationery Market Revenues for the period 2014-2024F. •	Historical & Forecast data of the Bangladesh Copier Paper Market Revenues & Volume for the period 2014-2024F. •	Historical & Forecast data of the Bangladesh Notebook Market Revenues & Volume for the period 2014-2024F. •	Historical & Forecast data of the Bangladesh Drawing Book Market Revenues & Volume for the period 2014-2024F. •	Historical & Forecast data of the Bangladesh Other Notebooks Market Revenues & Volume for the period 2014-2024F. •	Historical & Forecast data of the Bangladesh Diary Market Revenues & Volume for the period 2014-2024F. •	Historical & Forecast data of the Bangladesh Other Paper Stationery Market Revenues for the period 2014-2024F. •	Historical & Forecast data of the Pen Market Revenues & Volume for the period 2014-2024F. •	Historical & Forecast data of the Pen Market Revenues & Volume, By Types for the period 2014-2024F. •	Historical & Forecast data of the Pencil Market Revenues & Volume for the period 2014-2024F. •	Historical & Forecast data of the Pencil Market Revenues & Volume, By Types for the period 2014-2024F. •	Historical & Forecast data of the Eraser Market Revenues & Volume for the period 2014-2024F. •	Historical & Forecast data of the Art Stationery Market Revenues for the period 2014-2024F. •	Historical & Forecast data of the Scale Market Revenues & Volume for the period 2014-2024F. •	Historical & Forecast data of the Pencil Box Market Revenues & Volume for the period 2014-2024F. •	Historical & Forecast data of the Sharpener Market Revenues & Volume for the period 2014-2024F. •	Historical & Forecast data of the Files and Folders Market Revenues for the period 2014-2024F. •	Historical & Forecast data of the Adhesives Market Revenues for the period 2014-2024F. •	Historical & Forecast data of the Technical Instruments Market Revenues for the period 2014-2024F. •	Bangladesh Stationery Market Trends and Developments. •	Bangladesh Stationery Market Overview on Competitive Landscape. 14.2 Bashundhara Paper Mills Ltd.
14.5 Nitol Curtis Paper Mills Ltd.